One evening recently Sage previewed for me a game called Adventure Capitalist, a free multi-platform game about making money owning businesses. I decided to give it a try recently and being an entrepreneur, investor & personal finance geek, I became immediately engrossed in the game. Now over one hundred hours of maniacal clicking later I've decided to force myself to uninstall this crack-laced demon, because I have important things to do - like running a business in real life. Also sleeping and eating. Me contemplating my life choices. 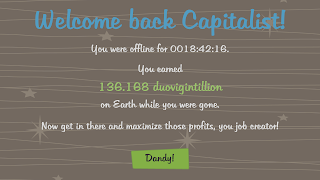 To be completely honest I've had a great time playing Adventure Capitalist. I enjoyed a similar game - Robert Kiyosaki's "CashFlow" - which I would consider a more realistic version of Adventure Capitalist that's intended to teach personal finance, cash flow & investing. I also loved Monopoly as a kid, although the Game of Life never interested me as much (probably the part at the very beginning where you start by getting married and having kids). If any of those games ring a bell for you personally, it's worth giving Adventure Capitalist a try. The game starts you with a single free lemonade stand, and you sell lemonade by clicking the stand until you have enough earnings to purchase a second stand, increasing your profits per click. 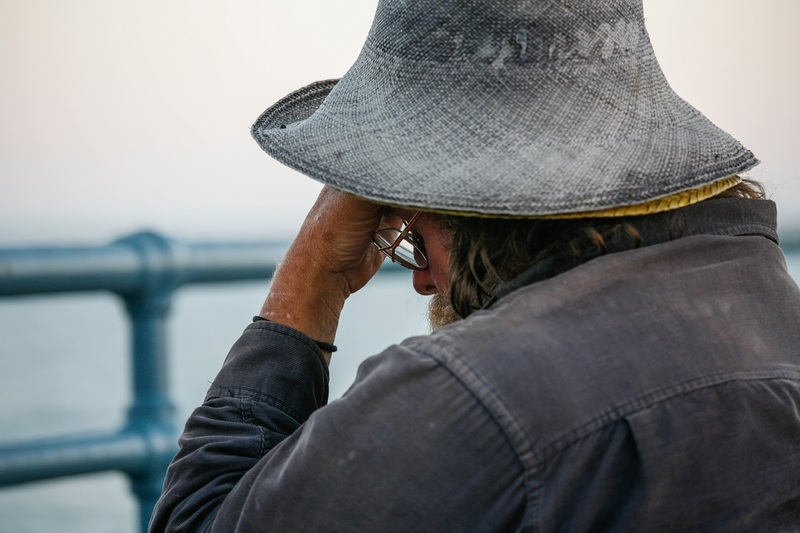 Purchase enough stands and you'll be able to hire a manager to run your stands for you, and you can move on to purchase larger businesses like newspapers, car washes, and donut shops, eventually working your way up to bank and oil field ownership. Increasing cash flow attracts angel investors, which provide a cash flow boost and can be collected by resetting the game and basically starting all over, but with a much faster growth rate. In-game purchases are possible although not necessary, and will speed up the rate at which you acquire cash. You can also acquire the in-game currency (gold) through unlocking achievements at various milestones. Most freemium games do similar, offering just a taste of what the in-game currency can do with the hope that you'll reach for your credit card and buy more. As I said in my Pokemon Go Vacation Wrap-Up, it's fine to spend money on a game you enjoy, in fact it's good for the industry! While I was tempted to more than once, I haven't spent any on Adventure Capitalist, opting instead to grind my way up through the levels. The problem with the game for me personally is it never ends. I struggle to control my play time with deep games that mix theory crafting, level advancement and unclear end points. 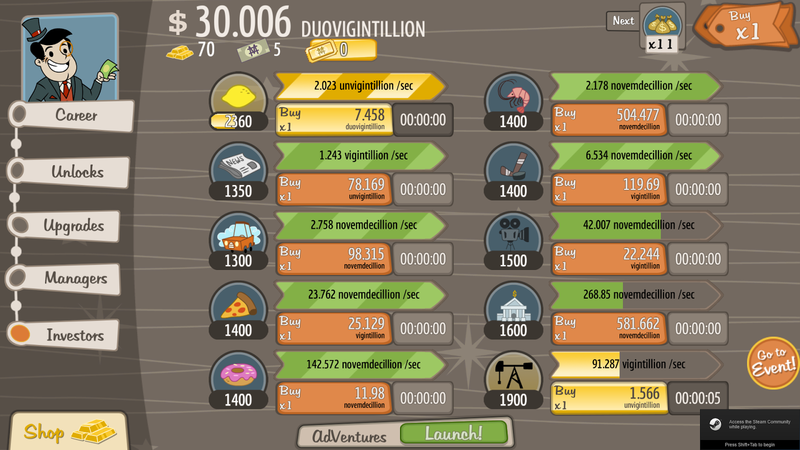 With Adventure Capitalist, billions become sextillions become duovigintillions and on and on. There are always more businesses to buy, more unlocks to reach, and more upgrades to purchase. If you get bored of the Earth campaign you can travel to the Moon or Mars, because why manage one planet when you can rotate between three? I found myself in the vicious cycle of resetting one planet and building it up to a place I was happy at, only to switch to another planet that needed my attention and do the same thing. Stepping away from the computer for only five minutes I had the urge to return and buy more businesses. That's not even a real number. 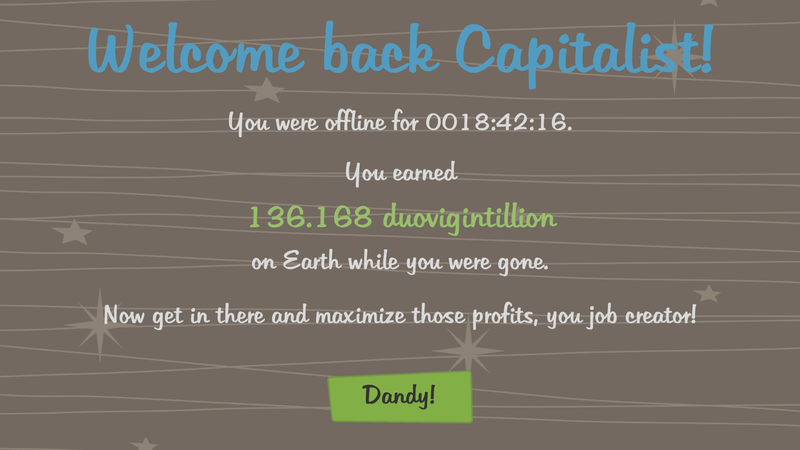 Perhaps that is the point of Adventure Capitalist? Maybe the creators are making a statement on greed and the human condition of never settling for enough - that there is potentially no end to the increasing pursuit of wealth and more. For however much we have, there can always be more, and the pursuit therein can consume a person. Anyhow I would definitely recommend you give this game a play. It's available for free on all major consoles, through the Steam store, or on iOS/Android stores. I may return to play it again sometime in the future, but for now I've had my fill! Update - A few weeks after publishing this blog in September I booted up the PS4 version just to check on the status. I had previously been playing the Steam version. Needless to say it didn't take long before I was hooked again. This became a daily ritual - show up at the shop after work, reset my angels and spend an hour (or five) building back up again. I always seemed close to finishing the game and blew through Mars and Earth quickly, but the Moon proved a challenge. There is an oxygen bar grind that is literally months long. Madness. Also the PS4 version doesn't include special goodies offered in the Steam version that accelerate your progress, like the 500 gold for finishing Earth and resetting. I estimate it took me around 10 months of daily play from when I started in September to when I maxed everything out in late July and earned the last trophy. I immediately uninstalled the game and set fire to the Playstation 4, and vowed never ever to play this game again.